This tool calculates the basic geometric properties of a cylinder, with a circular base. Enter the shape dimensions 'r' and 'h' below. The calculated results will have the same units as your input. Please use consistent units for any input. 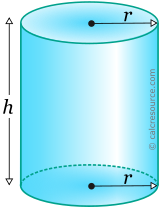 The cylinder is a solid object enclosed by two parallel planar bases and a lateral cylindrical surface. Typically the most recognizable cylinder is the one with circular bases. where r the radius of the circular base and h the height of the cylinder. where \(A_b = \pi r^2\) the base area.